In the last five years as a legislator I have worked hard to fully fund our education system. We have built a great foundation and yet, there is still more to be done. We need to increase support staff in our schools to be able to identify the social, emotional needs of our children. The need for smaller class sizes continues to be an issue. I am very committed to continue to look at school safety. No parent should be worried about sending their child to school. We need to take a comprehensive approach to solving this problem, instead of just wanting to put a band-aid on this crisis. I have a passion for our schools and for assuring that all children succeed academically. I currently serve as a school counselor in the Everett School District where I work with youth in both a teaching and counseling capacity. The stories of my students and families have motivated me to bring their voices to Olympia and impact public policy. In my participation with various organizations, I have had the great privilege of traveling around the state to talk with hundreds of families and children who have shared with me many stories, challenges and inspirational dreams. If we want our children to truly succeed, it is imperative we solve our statewide crisis of teacher recruitment and retention so we can keep quality educators in our classrooms. In order to do this, we must strive to have our educators compensated and treated fairly! Businesses thrive when they have an educated work force and I am committed to building a 21st century workforce that will make sure Washington succeeds for years to come. It’s simple really: when our children succeed our state succeeds. For over 25 years I have worked on behalf of children and families directly in various positions at not for profit agencies. This work has given me a deep appreciation and understanding for human services and what they can do to help families and most importantly children succeed. My experience as a member of the House Early Learning & Human Services Committee has allowed me the opportunity to improve the conditions for our state’s most vulnerable and push for more funding to our safety net. We need to make sure the resources our families need are available and efficient. We can’t balance budgets on the backs of our most vulnerable and it is important that we find a way of funding our priorities while ensuring seniors, veterans and struggling families get the support they need in this tough economy. Thousands of families have been greatly impacted by the changes to the Affordable Health Care Act. 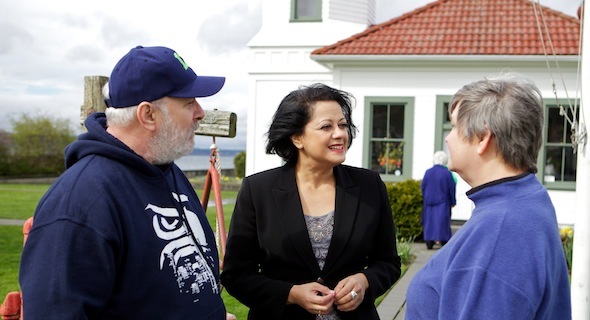 I will continue to fight for all residents of the state of Washington to have access to health care. Health care should be a right not a privilege. As a past small business owner, I know that it’s time to make critical investments in our workforce, local infrastructure and transportation system. I believe that government can be a partner in building our economy. We need to make sure we are expanding access for worker retraining by utilizing our institutions of higher learning and providing a wide range of career options for our future workforce. I will prioritize making tuition more affordable and work to increase the number of enrollment slots in community colleges, tech schools, and four year colleges so our local kids can get the degrees they need as they move into the workforce. We must also recognize that our workforce is diverse, so we must provide more opportunity for apprenticeships in various fields. As a member of the House Transportation Committee, I worked tirelessly to bring thousands of dollars and hundreds of jobs into Snohomish County’s through one of the largest Transportation Budget Packages Washington has ever seen. Although we have made great strides in transportation investment, we must not stop, continuing to fund our local transportation system has to remain a top priority. Local businesses, big and small have demanded we take action and we must listen. We need to continue to reduce gridlock and invest in transit to help ease congestion along our major commuter corridors, while also protecting our environment. Businesses are losing thousands of dollars a day when our highways are clogged and we can no longer kick the can down the road. As a mother I know that safe communities mean secure families. We need to make sure we are passing common sense laws and that we are investing in training for our local police and public safety personnel. This means partnering with local law enforcement to ensure they have the funding they need and passing common sense laws to prevent repeat DUI offenders from getting back behind the wheel. We have all seen the tragedies in recent years and it is time to enact real reform to ensure that no family experiences the tragic loss of a loved one. This year, Washingtonians will be able to vote for a common-sense way to make our state safer; Initiative 1639 would raise the age to purchase a semi-automatic assault rifle to 21, and make sure that people who want to purchase these weapons have gone through the same kind of background checks already required for handgun buyers. It’s a comprehensive measure to keep schools and our communities safe. Additionally, we can and should do more legislatively by passing evidence-based gun violence prevention policies that will make Washington safer and save lives. I support taking additional commonsense steps to prevent gun violence.